As with many of the blogs I read, I'm finally able to post about the projects I've been working on for the last...oh... two months! 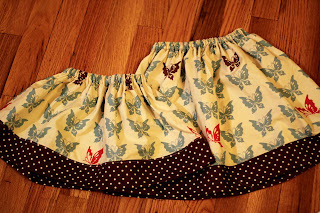 Some skirts for a friend of mine to give to her nieces. 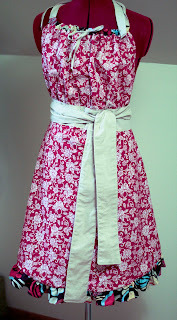 The Josephine Apron from the book A is for Apron. The other side of the Josephine apron. 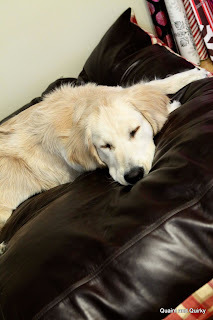 Levi got a leather and plaid dog bed. Here he doesn't look too thrilled about it. But he seemed to like it later! 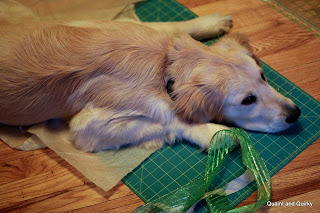 As always, he is a big help to me when I need to produce a million Christmas presents in three days. He takes his role as fabric/pattern warmer very seriously! Many *many* more gifts were made...I'll post more later! 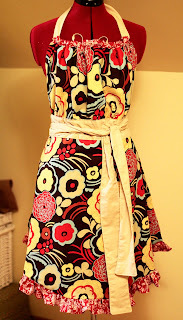 Love your apron and skirt projects! Especially the fabric. It is always so nice to see photos of Levi. He's grown quite a bit, hasn't he? Wishing you and your DH a very Happy New Year Keri! I just found your blog and love your profile! I am just like that. Especially the Red Sox part! I love the apron! 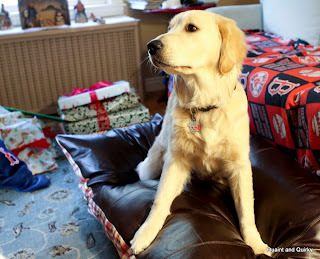 I just found your blog, I also live in New England. I look forward to reading!